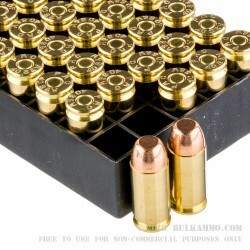 This box of .40 S&W ammunition offers clean and accurate range shooting at an affordable price. The cartridge fires a 165 grain bullet at 989 feet per second. Each box holds 50 rounds. 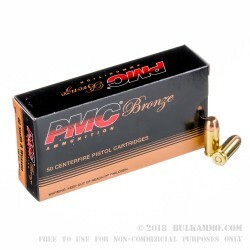 PMC Bronze ammo is known among shooters for reliable feeding and solid performance. 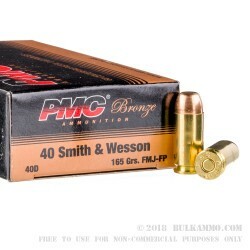 All PMC Bronze ammo uses reloadable Boxer-primed brass cases. PMC (Precision Made Cartridges) is a brand of the Poongsan Corporation, a South Korean munitions company. In business since the 1960s, Poongsan follows stringent quality control procedures and manufactures its own components for maximum reliability and consistency. The company possesses extensive capacity due to its status as a supplier for the South Korean armed forces, and uses this capacity to offer large quantities of affordable, well-made ammo to the US market. Q: Are these new from the manufacturer? A: This ammo is new from the manufacturer. All components used are of premium quality and do not contain any corrosive components. 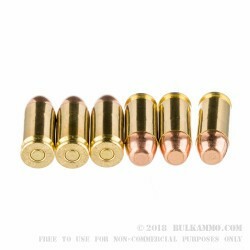 This brass is boxer primed and may be used for reloading as well.